Published on Thursday, March 13, 2008. This article appears in the April/May 2008 issue of American Craft Magazine. Hare Platter, 1982, salt-fired porcelain. "How does the son of a Rust Belt worker become a world-renowned ceramist?" asks the ceramics historian Garth Clark in the biographical essay that begins this monograph on Ken Ferguson (1928-2004), a giant of American ceramics. The answer, we learn through the contributions to the book, is hard work, a powerful belief in himself, diverse artistic interests, a deep love for his métier and, in crucial instances, excellent timing. There is some overlap of information in the essays, but the result is a rich portrait of the artist and an illuminating study of his formidable oeuvre. Ferguson's initial escape from his mill town background-first in Indiana then Pennsylvania-began when he attended Carnegie Institute of Technology to study art. By chance, his army service during the Korean War was in Japan, a country he found to be an aesthetic revelation. Returning to his alma mater on the G.I. Bill, he was introduced to ceramics and became instantly hooked. Heading to Alfred University's College of Ceramics, where he studied under such teachers as the legendary Charles Harder, Ferguson received along with an M.F.A. in 1958, the solid training necessary to become a studio potter. His trial by fire, so to speak, in that vocation was his six years as director and resident potter at the Archie Bray Foundation at a particularly precarious moment in the history of that unique Montana institution. He moved on in 1964 to the Kansas City Art Institute, where he was invited to set up the ceramics department. It was a perfect fit, and he taught there until his retirement in 1996, creating a nationally recognized department and nurturing talents like John and Andrea Gill, Richard Notkin, Chris Staley, Akio Takamori and Kurt Weiser. The writer Peter Von Ziegasar's essay stresses Ferguson's remarkable qualities as an educator-demanding, sometimes intimidating, but always concerned about his students' lives and careers, liberating them to make art. At KCAI Ferguson found a balance between his teaching and his own art without shortchanging either. 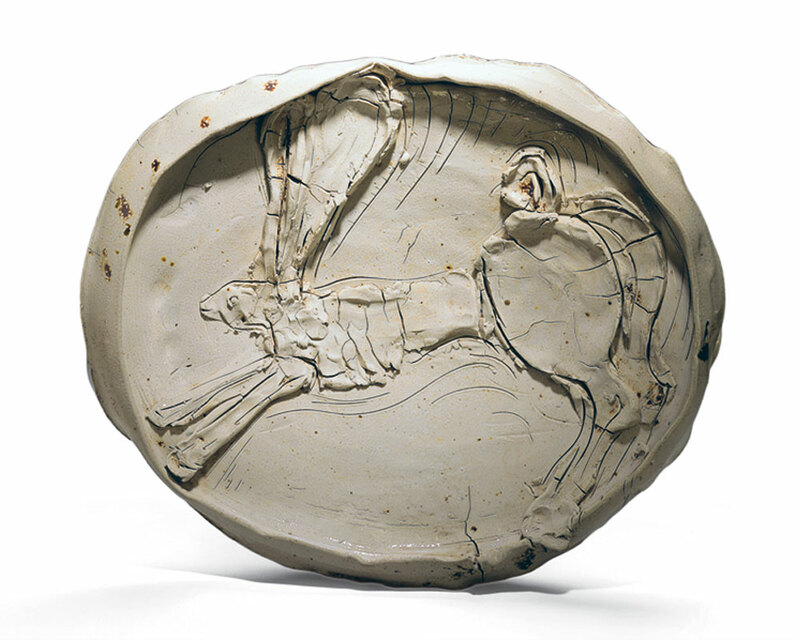 The critic John Perreault traces the development of Ferguson's work from "restrained (and quite elegant) pottery, to more overt self-expression (the slump pots and wild glazes), to the animal tales." Ferguson's skills at drawing-of nudes, mermaids and animals-especially hares-were an important asset as he segued from functional pottery into more sculptural and personal expression. The book is handsomely illustrated with photographs of 55 Ferguson works from 1960 to 2003, interspersed with images of the artist in his studio in later years and vintage photographs as well. Ted Rowland, a friend of Ferguson's who produced the book, contributes an interview with his subject and reminiscence. The book ends with an amalgam of Ferguson's writings and conversations meant to be regarded as his last lecture. Coming full circle, he emphasizes the importance of the wheel. "I still believe in learning to throw pots-you get to know the materials-you can express ideas very fast-thrown pieces can be used to hand-build larger pots. If you go through the discipline of learning to throw well, glaze and fire a kiln, you are deeply into the medium... The wheel is a good way to start." 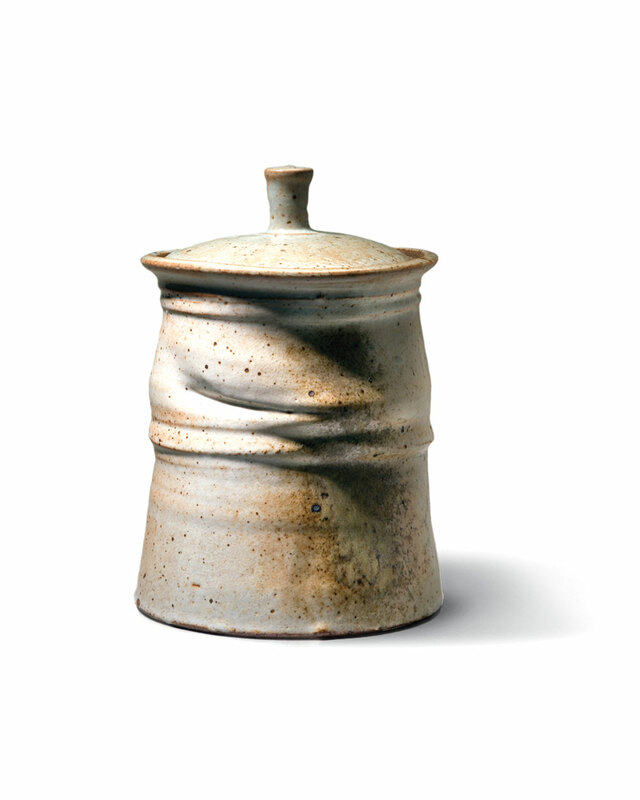 Slump Jar, 1977, wood-fired stoneware, shino glaze. porcelain vessels at Portland's Museum of Contemporary Craft.